When you feel people stretching you thin, you feel your heart enlarging. 40-something. You’re about half way there, old BraveHeart. Half way. Barring an extravagant act of God and a lifetime of green smoothies, there is, at best, only half the track still stretching out ahead of you like your last invitation. So live backward from your 90th birthday cake. Always: Live backward from the end goal. Look at who’s in the room singing off tune on your 90th birthday — and who are you making room for right now? I’m hankering to be the weathered woman of 9 decades, hunched over her cake, looking around a room of babies slung on hips and gangly, grinning teenagers and the gathering of the generations who know the words to the Old Rugged Cross and Psalm 23 by heart and the language of thanks is their mother tongue. I envision a rising of accents and the richness of skin colours and a poverty of spirit that knows the luckiness of Jesus-grace, and I hear the raucous of a room of the gloriously rowdy and live your life backwards from that last birthday cake. Only the people you make priorities now will make you one of their priorities in the end. Have a baby in your 40s. Adopt her, hold her, rock her, loose sleep over her, fall in love with her. Change diapers, change sheets, change course — change everything in mid-life, to be laughing nose to nose at the local pizza joint with your tousel-headed four-year-old wearing her scuffed up Peppa Pig crocks, four days before you turn 45. Making a small person one of your greatest priorities makes your life great. Read through university applications with one brave kid before supper and read Beatrix Potter with a little kid on your lap after supper and grow soporific with surprising grace. Love is always inconvenient and inefficient and indestructible. I’m holding on to this with all my life. Stay in touch, stay in truth and grace, and stay in the Story and, above all else: stay in love. Life is too short to move on to anything else. Risk it all. Risk large, risk now, risk your heart, risk for what ultimately matters. Go back to school. Go reconcile. Go make it right. Invest in a dream that terrifies you. Do the hard thing that terrifies you. Start a business, a class, a soup kitchen, a friendship, a dinner club, a memoir, a church, a marathon, a family. Just start. Start over. You life is art and there’s no art without risk. Risk is your friend who walks with you where you want to go. Risk is the friend who knows the way to where you want to go. Enjoy risk’s company. Live into something bigger than you, that will require more than you, that will require faith and hope and miracles and God. Why waste your one life on any one’s small box? Life doesn’t have to get easier to be good. All you have to do is just get closer to a good God. Commit to more than a prayer life. Make your life a prayer. Make your work your worship, make your days your doxology, make your life your liturgy, and make Christ your only King. Your work may burn up or cause you to burn out, but the prayers enfolded into the stacks of laundry, the soup stirred soup, the stairs swept — they will survive fire. begins with a daily overdose of Scripture. Leave a Bible open to the Psalms by the sink, on the desk, at the table, eat His book every time you eat because the truth is: Stay in His Story to stay walking on waves. What you focus on — is what you become like. Focus on good — and you’ll see more good everywhere to focus on. And yet, truth is, after all this? Bottom line? You will look in the mirror and you’ll see it in your eyes: You will have done a whole mess of things kinda shatteringly wrong, and I mean a whole lot more than throwing in a few lights with a load of darks. Throw more lifelines than stones. Give more grace than advice. Hunger for integrity more than popularity, celebrity, or prosperity, — because your integrity is your only legacy. The easy way to what you want — isn’t the same as the narrow way to what you’ll want for all eternity. Choosing the path of least resistance — can turn out to be the greatest mistake of your life. And do what feels good now — and you could feel bad for longer than you ever imagined. do what feels good now — and you could feel bad for longer than you ever imagined. Being broken keeps you soft —- and it’s exactly where there is broken and soft soil that there is growth. Let the rains come, let whatever needs to rain simply come, and grow whatever He needs to grow, however He needs to grow it, because He reigns and knows what is best, and in our tender surrender, the glory of our God wins. There may be another 40-something years left, there may only be another 16,425 days left. And honestly? As many days, as moments, between here and 90, or as many remain? These three are really all you can control everyday: Your grittiness, your gratefulness, and your givenness. Your grittiness, your gratefulness, and your givenness. Every day you can choose how much grit you bring to the table. Every day you can choose how much gratefulness you’ll offer up at the table. Every day you can choose how much you’ll live given so more people know they belong at the table. Grit, gratefulness, givenness. And the carrying grace of a good God. That’s ultimately what you’ve got every day. 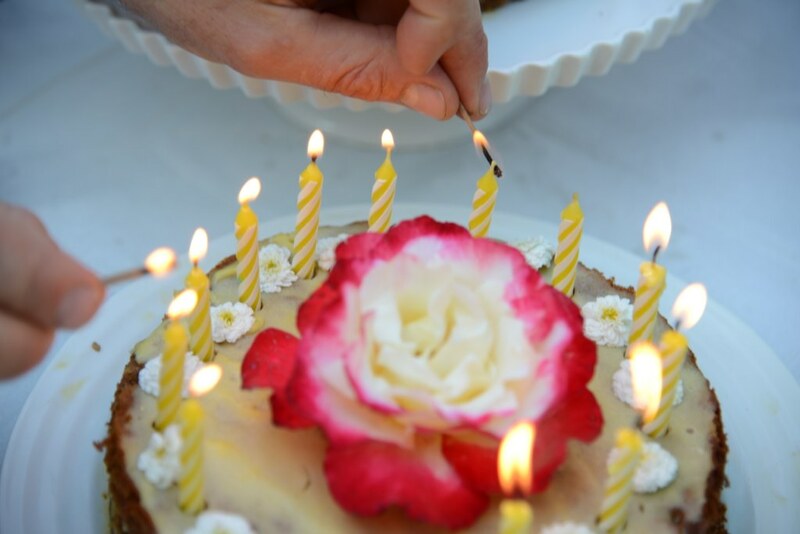 So… when you’re mid-life and you go to blow out those forty-something candles? so every day is your party and you can be fully and freely released, if you want to be, to let all of your moments eat the cake of amazing grace.